Oxford University Press, USA, 9780190699529, 272pp. Civil wars are among the most difficult problems in world politics. While mediation, intervention, and peacekeeping have produced some positive results in helping to end civil wars, they fall short in preventing them in the first place. In Incentivizing Peace, Jaroslav Tir and Johannes Karreth show that considering civil wars from a developmental perspective presents opportunities to prevent the escalation of nascent armed conflicts into full-scale civil wars. The authors demonstrate that highly-structured intergovernmental organizations (IGOs such as the World Bank, IMF, or regional development banks) are particularly well-positioned to engage in civil war prevention. When such IGOs have been actively engaged in nations on the edge, their potent economic tools have helped to steer rebel-government interactions away from escalation and toward peaceful settlement. 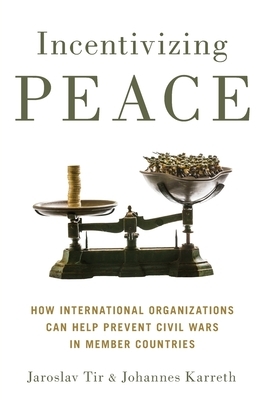 Incentivizing Peace provides enlightening case evidence that IGO participation is a key to better predicting, and thus preventing, the outbreak of civil war. Jaroslav Tir is Professor of Political Science at the University of Colorado Boulder and author of over two dozen scholarly studies on domestic and international armed conflicts, conflict management, territorial disputes, environmental security and cooperation, and rally around the flag dynamics. He is also a recipient of National Science Foundation and Fulbright grants. Johannes Karreth is Assistant Professor of Politics and International Relations at Ursinus College in Collegeville, Pennsylvania. His research focuses on international organizations, military interventions, and political violence. Additional scholarly work includes analyses of how voters respond to changes in the landscape of political parties and immigration.